Enter the radicand (the number you are trying to find the square root of), which can be any number greater than or equal to zero. The radicand is the number inside the radical sign (√), whereas the index is located to the left and above the radical sign. If you wish to find the square root of a fraction, enter the fraction into the mini conversion calculator and I will convert it to a decimal and enter it into the radicand field for you. This is result of the square root calculation. If the result is a lengthy decimal number the result is most likely an approximation. In any case the result always represents two square roots (one positive and one negative). This calculator will calculate the square root of a number and indicate whether or not the radicand is a perfect square. Plus, unlike other sites with a radicand calculator, if the radicand is not a perfect square this calculator will calculate the nearest perfect squares that are greater and less than the entered radicand. If you would like to find the square (or any other power) of a number, please visit the Exponent Calculator. Enter the radicand. Note that you can enter non-negative decimal numbers for the radicand. This also means that if you wish to find the square root of a fraction, a mini fraction-to-decimal calculator is located in the pop-up tip for the Radicand line. Click the "Calculate Square Root" button. This will find the square root of the radicand and let you know whether or not it is a perfect square. And if not perfect, the result will show the perfect squares nearest to the entered radicand. Numbers that are equal to a whole number squared (see a list of perfect squares under the Learn tab). Square roots and perfect squares. Definition of a square root: The opposite of squaring a number. For example, finding the square root of 81 is the same as asking, "what number when squared is equal to 81?" Of course, if you know that 9 x 9 = 81, you will know that the square root of 81 is 9 (92 = 81). However, what you might not realize is that -9 is also a square root of 81, because -9 x -9 also equals 81. In other words, all numbers greater than zero (zero can never be negative or positive) have two square roots -- one positive and one negative. This is why when using an online square root calculator the result will always be preceded by a ± sign. As for negative numbers, since a negative times a negative always yields a positive number, negative numbers cannot have a real value square root. 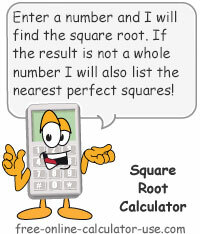 If you are still having a hard time understanding square roots, please let me know in the feedback form located beneath the calculator and I will try to improve my explanations on this page.